Serving as a Platoon Leader in the Army National Guard and Army Reserves is a challenging, demanding and rewarding job. In fact, few people outside the military will ever get the experience to lead 20 to 50 or more people and oversee $1 million or more in equipment. And to think that you get to do that in your FIRST Army job. How awesome is that? As a part-time Platoon Leader, you must learn how to effectively accomplish your mission and take care of your Soldiers, while balancing your civilian career, family time and personal life. If you don’t know what you are doing, you will be burn out and overwhelmed. I don’t want that to happen to you. Instead, I want you to be an effective, efficient and excellent Platoon Leader. 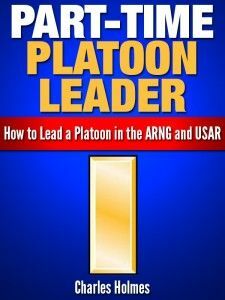 My goal is to teach you what you need to know to achieve Platoon Leader success. If you want to find a “better way” to enhance your effectiveness, improve your time-management skills and learn how to get things done better, faster and more efficiently, I’m here to offer you a solution. My name is Charles Holmes and I know exactly how you feel right now. Having spent just over two years in Company Command, I always searched for ways to help my Platoon Leaders succeed. I wanted my Platoon Leaders to develop their potential, have fun, be challenged and achieve success. I also wanted them to have BALANCE between their military responsibilities, civilian job, family life, and personal time. When I first took Company Command, I relied on my Active Duty experience to help me lead, coach and develop my subordinates. Throughout my time in Company Command, I searched the Internet, book stores and local library for resources to help me prepare my Platoon Leaders for positions of increased responsibility. Unfortunately, everything I found was geared for “Active Duty” Platoon Leaders. I made a vow when I finished Company Command to create a resource specifically for Army National Guard and Army Reserve Platoon Leaders. Throughout my time in Company Command, I kept notes on what worked well for my Platoon Leaders. We also kept notes on what didn’t work. That’s how my new Platoon Leader eBook “Part-Time Platoon Leader: How to Lead a Platoon in the ARNG and USAR” developed. The purpose of my Platoon Leader eBook is to help you be the best Platoon Leader you can be. I want to give you helpful hints and advice to help you have a squared away platoon and also have time for your job, family and personal life. · & So Much More! BUT WAIT. There’s more. You will also get 3 FREE Bonuses. Discover my list of favorite books for Platoon Leaders. These books will teach you new skills and help improve your effectiveness. Learn 8 simple things you can do to be a better Platoon Leader. This special report will blow your mind. Discover an amazing list of 50 platoon names to choose from to name your Platoon. Your platoon MUST have a platoon name. This list will help you brainstorm ideas to find the perfect platoon name. STILL NOT CONVINCED! Don’t take my word for it. Here’s what others are saying about my Platoon Leader eBook! NOTE: This is a 93-page eBook in PDF format that will be delivered to you via email immediately after your secure payment through PayPal. Digital Product – Instant Email Delivery – Even at 2:04 a.m.
P.S. This is the eBook you should have received during OCS or R.O.T.C. Don’t miss out on this great information. It will help you build a strong leadership foundation you can use through your entire military career.